Authorities said there was no evidence the crash was terror-related. A US NAVY veteran who plowed a car into pedestrians in New York’s Times Square, killing a woman and injuring 22 other people, has been charged with murder and attempted murder, police said. Yesterday’s incident sparked fear in the US financial capital after deadly car-rammings in London, Berlin and the French city of Nice, but authorities said there was no evidence the crash was terror-related. Richard Rojas, 26, a former Navy electrician from the Bronx, was arrested at the scene and later charged with one count of murder in the death of an 18-year-old tourist and with 20 counts of attempted murder. Police confirmed the identity of the young woman who was killed on the spot — Alyssa Elsman, 18, a tourist from Portage, Michigan. Her 13-year-old sister, Ava, was among the injured, four of whom were in critical condition. 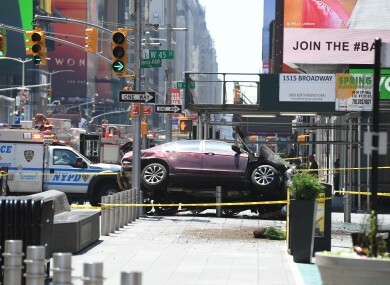 Shortly before noon yesterday, Rojas’s Honda Accord suddenly hurtled onto a Seventh Avenue sidewalk in Times Square — one of the world’s busiest districts — and continued on for three blocks, bowling over pedestrians and sending others fleeing in fright, police said. The car came to a halt after colliding with a metal pole. Rojas was arrested for drunk driving in 2008 and 2015, and detained earlier this month on charges of menacing behaviour, police said. He was submitted for drugs and alcohol tests after his arrest. News reports drew a portrait of a troubled young man who seemed changed when he returned home in 2014 from a three-year stint in the US Navy. A friend, Hansel Guerrero, told the New York Times that Rojas began expressing conspiratorial thoughts about the government, that he was often physically threatening, and was a frequent consumer of alcohol and cannabis. Several friends said they had encouraged him to seek psychological counseling, but he did not do so. Authorities said they were studying ways to reinforce security around Times Square, one of the city’s top tourist destinations. Police patrols there have already been beefed up in recent years, particularly after a 2010 car bombing attempt. Email “Times Square driver who claimed he 'hears voices' charged with murder”. Feedback on “Times Square driver who claimed he 'hears voices' charged with murder”.